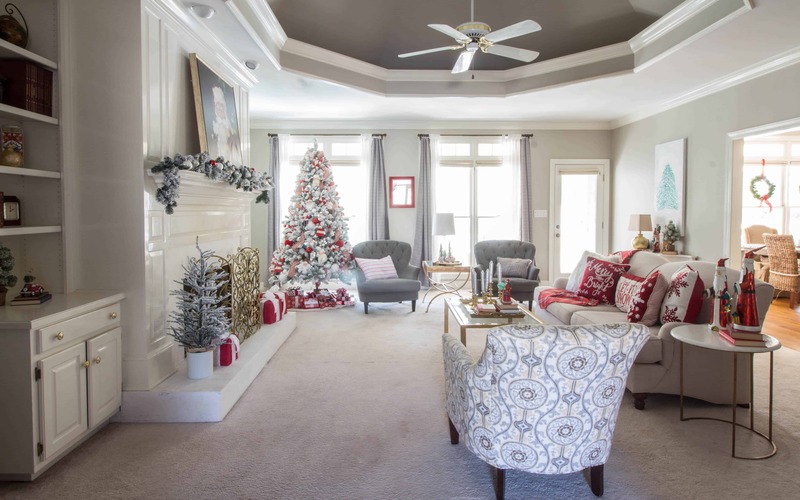 I am so excited to have the opportunity to be a host for the Christmas Tour of Homes 2018 again this year along with Carol from The Red Painted Cottage, Joy from The Aspiring Home, and Nicki from Sweet Parrish Place. 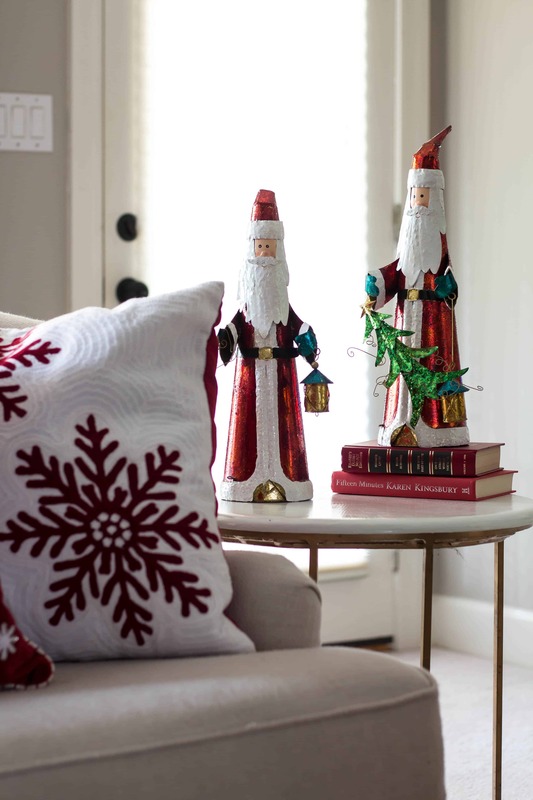 We have such a talented group of bloggers that are participating in the Christmas Tour of Homes this year. 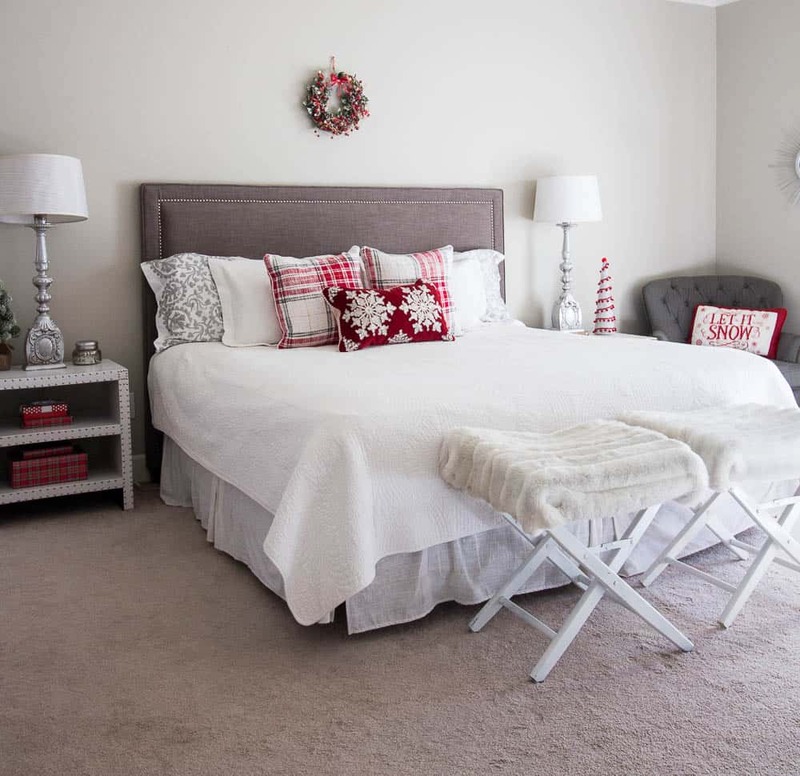 We will be sharing several blogger’s homes every day for the entire week. Be sure to visit every single one for Christmas inspiration. 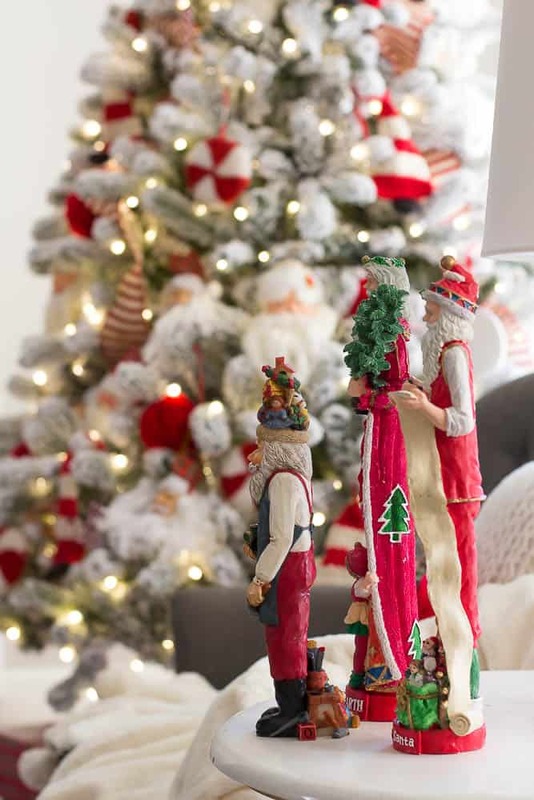 I recently heard someone say that those who love to decorate for Christmas and decorate early do it because it brings back childhood memories of Christmastime and I believe that to be true. When I get together will my siblings and my parents this time of year, we talk about the excitement she always had when we decorated our home for Christmas. We would pull out the same ornaments and decorations every single year and we would squeal when found our favorite things in the storage boxes. She always had Christmas music playing and we usually made divinity that evening too. She still uses the exact decorations and some of the ornaments are over 50 years old. I believe that she is the reason why I love to decorate for Christmas. Now that my children are older and the baby is a senior in high school, I have learned something that I wish I could have told my younger self. I felt like I wanted my children to be wowed and to think that Santa was good to them but just like me now, they only talk about the things we did at Christmas, not the gifts they received. They talk about how I always make a certain breakfast that made the house smell like cinnamon. They talk about the gag gifts that we have given them that still make them laugh. They talk about all the Christmas candy that we make every year. If you follow my blog, you know that I do not like to overspend or go in debt at Christmastime. I try to use Christmas decor that I already have, decor that I have found thrifting, and I may purchase a few things new. The Santa Clause painted on canvas was the thing that I purchased last year. It came from Hobby Lobby and I think that he will be on my fireplace every year. My garland is the garland from Walmart and it is under $13. I added a few Christmas balls to it and the great thing about this garland is that you can change it up every year. 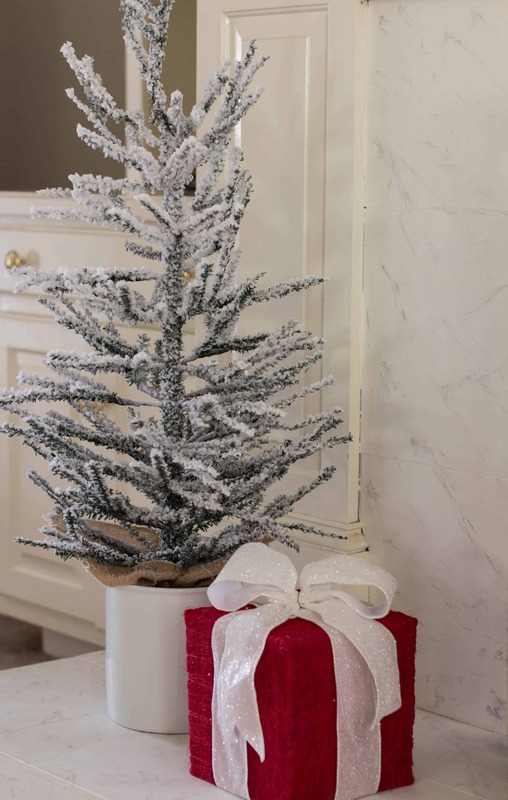 This 3-foot tree is also from Walmart and it is very inexpensive. I have had the set of red boxes for years but I had not used them because they had colors in the bows that I do not use anymore. I removed the lime green and red bow and replaced it with a beautiful white ribbon. I have always been drawn to color and especially at Christmas. 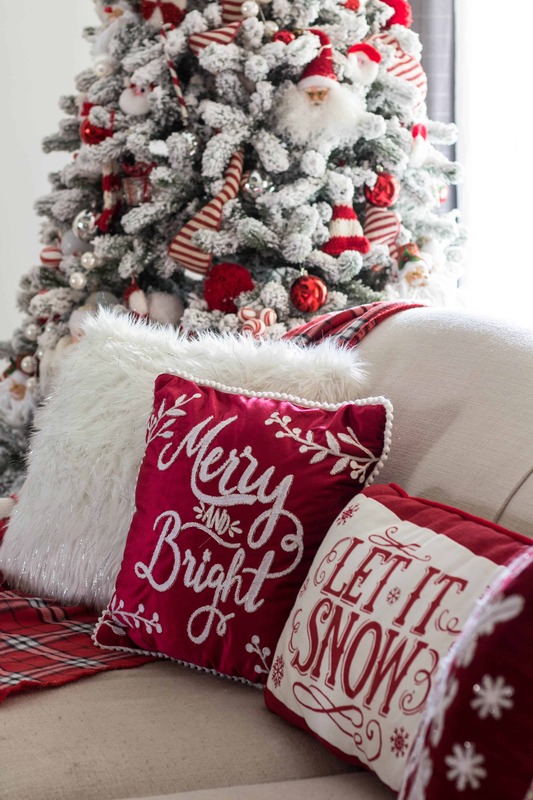 While I do love soft muted colors for Christmas, I really enjoy using bright reds and white colors and I feel that it is because it reminds me of Christmas as a child. I made the diy table runner by adding trim from a thrifted women’s shawl and a thrifted plaid table runner. I feel that it gives the table texture. 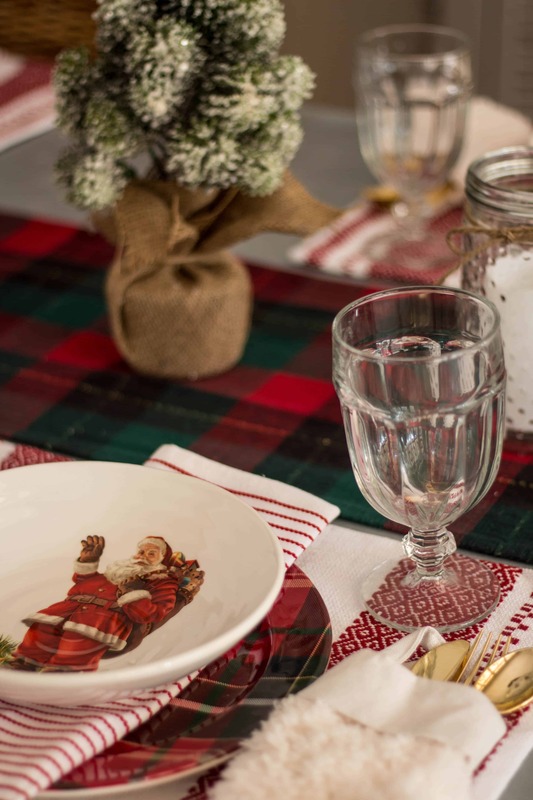 My Christmas table is set with Santa bowls sitting on top of a plaid Charger. I scored the tea glasses at the thrift store but I found them also on Amazon. I used some tiny stockings that I have had for years to hold the eating utensils. Spreading Christmas through the house by adding red pillows to my bedding. 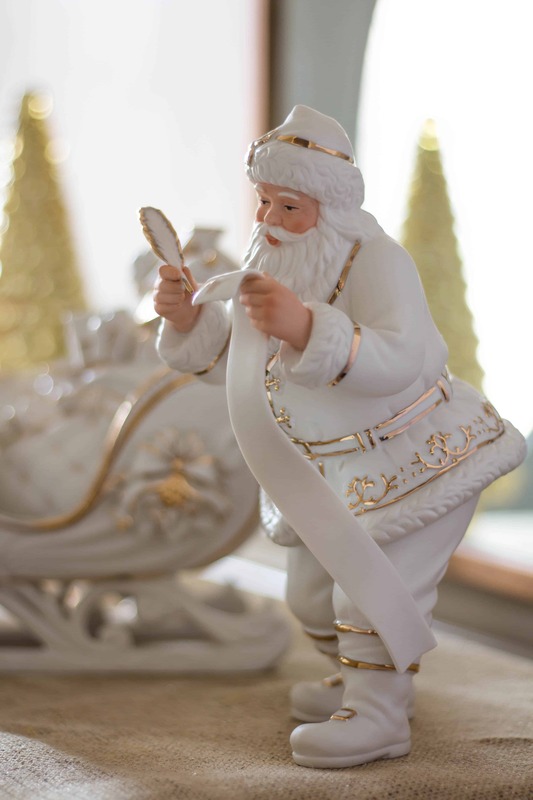 I have had the beautiful Lenox Santa sleigh set for a long time. It was a gift and I am so afraid of breaking it that I haven’t used it in several years. I decided that it is a shame not to use it so we are enjoying it this year instead of it sitting in the box in the attic. Isn’t this Santa is gorgeous? I hope that you have enjoyed the tour of my home and I hope that you find that you can use some of your decor by changing it up. Be sure to visit all of the other homes because I know that you will really enjoy them. Have a very Merry Christmas! Visit the other blogger’s home tours here. 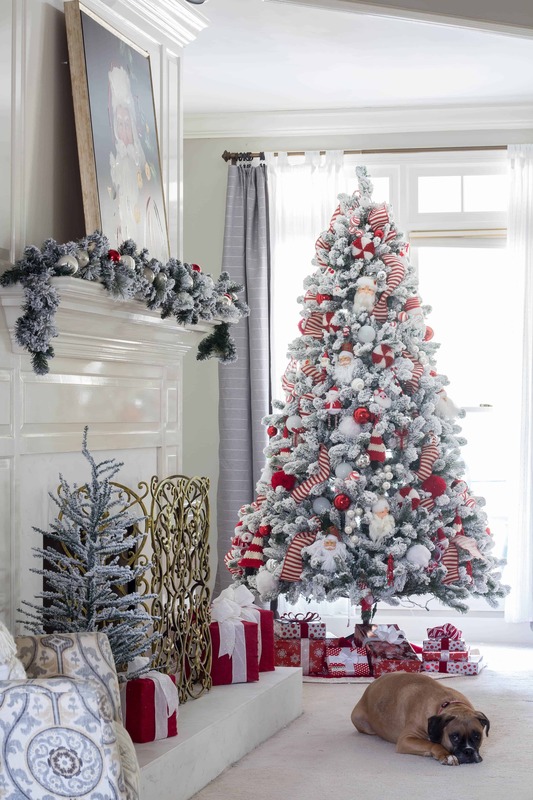 Your red and white Christmas decor is breath-taking! I love those cute pillows on your bed, and you table setting is so pretty. But I have to say – the wow factor is that gorgeous tree! The pops of red off of that flocking are perfectly Christmas. What a gorgeous home, my friend! 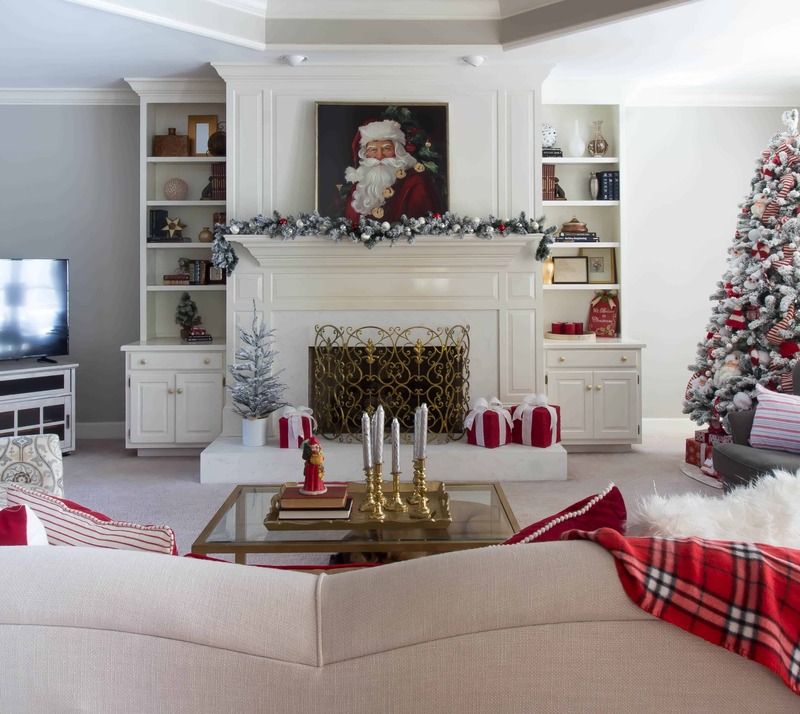 Your living room is one of my all-time fav red and white spaces. It’s magical. And I’m still loving that hand painted wall paper in the foyer and DIY dining table. Classic!! Thanks so much for sharing. Your home is beautiful as always! Did you get a knew camera or lens, because your photographs look amazing! I love that Lennox Santa, I have many white lennox ornaments that I place on my tree every single year, and this matches them perfectly! It has been so fun hosting with you this year, and I am so thankful and blessed to have you as my friend. Thank you Nicki! I did not get a new lens but I have changed my editing up after researching many photography blog post. So many beautiful ideas! Your dining room is amazing. Love the view of the windows of wreaths. Your table setting is adorable. Sherry, Your Christmas decor is stunning! 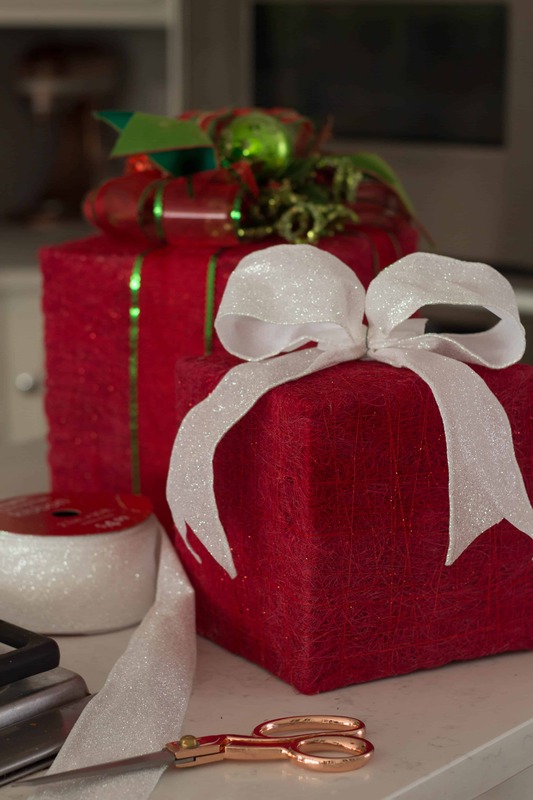 I love the simple red and white look and your ribbon is perfect for pulling this entire look together! I’m really smitten with your Lenox sleigh and Santa, along with the wreaths in all your windows. I’m so glad we worked together on this tour and that we’re friends! 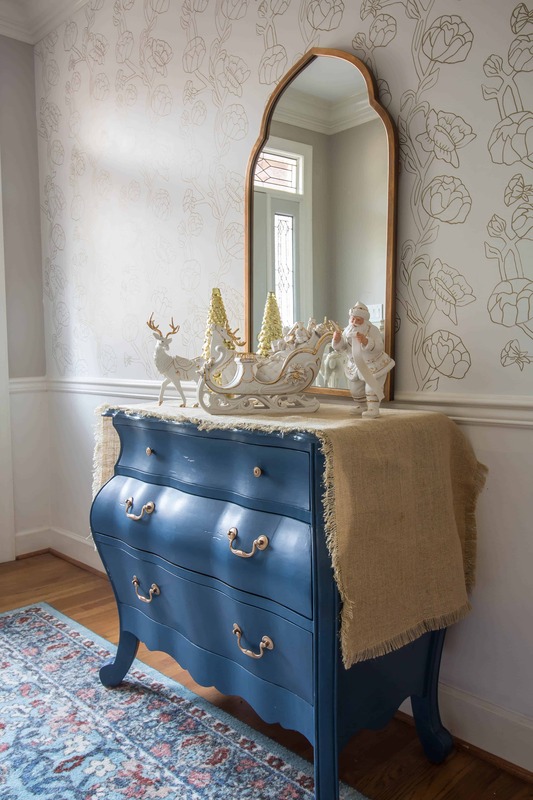 You have fabulous taste, that blue dresser is to swoon over. You do love color and I love that for the holidays. Beautiful home tour. 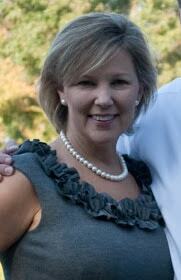 Hi Sherry! It’s so nice to meet you on this blog hop, and your home is absolutely beautiful. I’m amazed at some of your thrifting/upcycling tricks in here because everything looks designer quality! That Santa Claus painting immediately caught my eye. It works so nicely with that gorgeous tree of yours. I’m with you on the Christmas memories. I always loved reminiscing with family as we pulled out the ornament collection. Merry Christmas to you and yours! Thank you. It was so good to meet you too. I hope we do more tours together! Your home is gorgeous any time, but especially at Christmas. In this post, it is your words that touch me. In 2003 we stopped giving gifts in lieu of family vacations. We all have wonderful memories of spending Christmas mornings on the top of a mountain before we all skied down at our own pace – mean in last place. This year that tradition ends as our daughter wants to create their own memories with their little boy in his own home on Christmas morning. But, like on all of those vacations, I’ll be taking the treats I only make at Christmas. Thank you for the sweet compliment. The tree is from King of Christmas last year and I really love it. Love hearing about all your special memories and you are so right! That’s what it’s all about! Your home looks so beautiful! I love the way you decorated your tree and your table is gorgeous!! 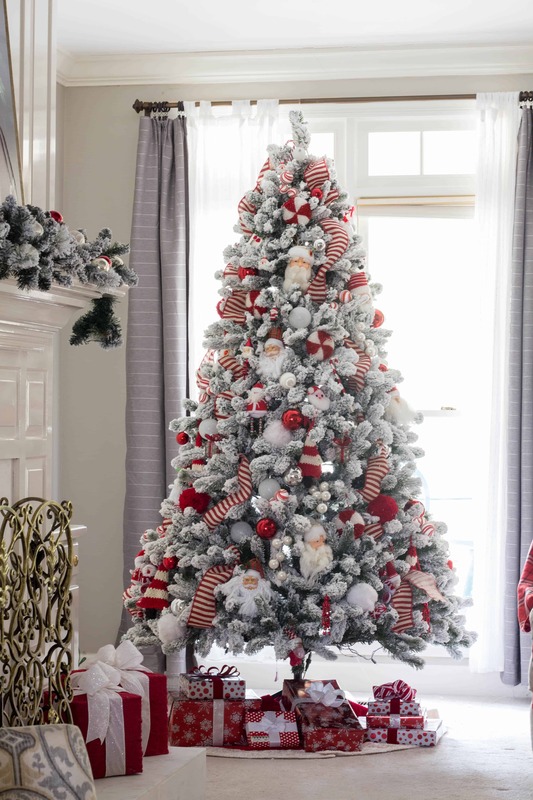 We have a tree that is kinda flocked, but man… I really want a 100% flocked tree after seeing yours! The white flocking really makes the red POP. I love that one photo of the Santa Clauses on the table with the tree in the background, so pretty! 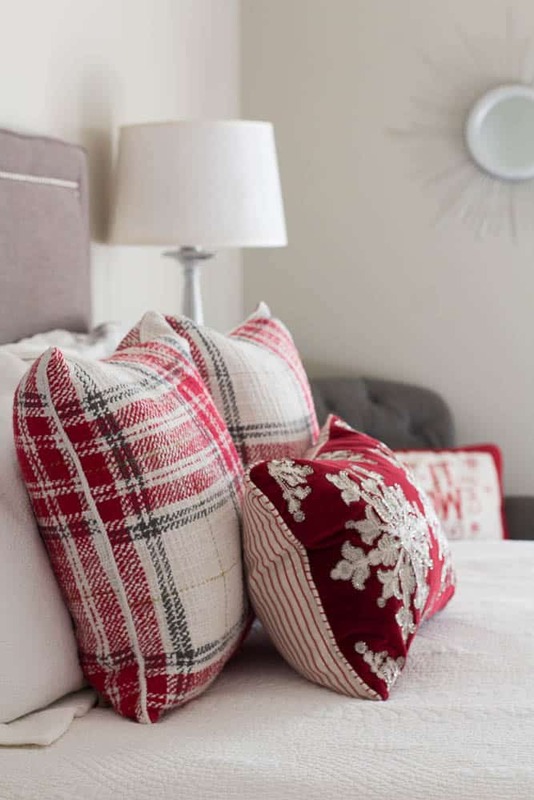 I haven’t done a bedroom in Christmas decor, but yours is so pretty with more pops of red from the pillows. 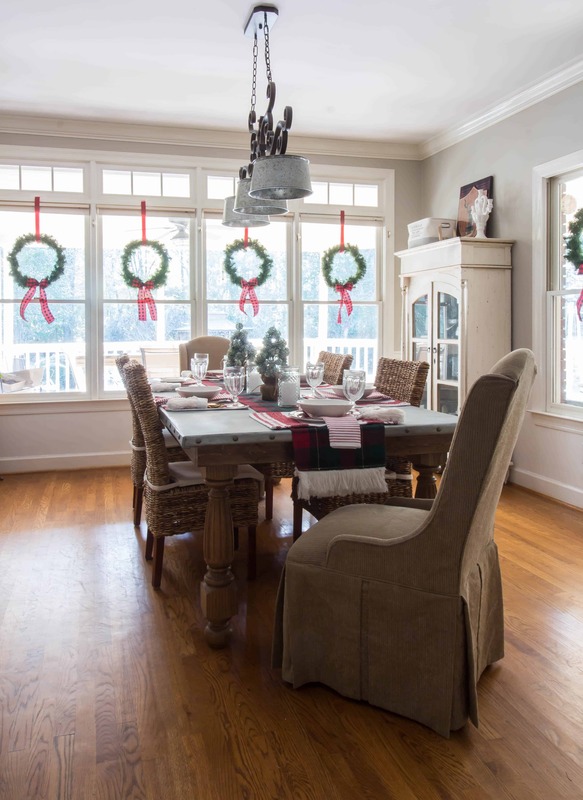 Those wreaths on the windows in your dining room are just GORG. I bet that room is so lovely with all of the natural light coming in! Thanks for hosting this blog hop!! I’m excited to visit everyones homes. I wish I had known your words of advice when my kids were younger too. It’s so true that the memories are feelings and not so much the gifts. You sound like a good momma. And your decor should be talked about and remembered too. It’s gorgeous! It gave me such a calmness and sense of peace looking through each picture. Loved it! Thank you so much. Your comment is so sweet! So, so true that many of our Christmas memories center around traditions, and not the gifts we received 🙂 Such a good reminder. Thank you so much for hosting this tour! I am so inspired by all the gorgeous homes. I LOVE that you are a bargain-hunter and reuse certain items year after year. Your home look absolutely beautiful. Love all the red! Thanks for sharing your home with us!